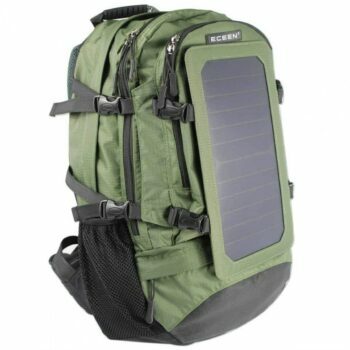 For the gearhead on the go, a solar backpack is an absolute must! 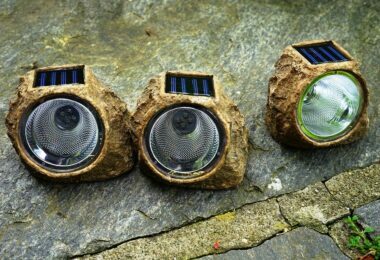 With the ability to hike in the beautiful sunshine while creating electric power for your phones, tablets, and laptops, you can enjoy nature without giving up your devices. Even a camping purist, who wishes to escape from the constant beeping of their cell phone may find it hard to resist this eco-friendly product. The ability to charge up GPS devices, and electric lights, is just one of the many benefits of carrying a backpack. Like most backpacks on the market today there are quite a few options for you to choose from and each solar backpack has its own special features. 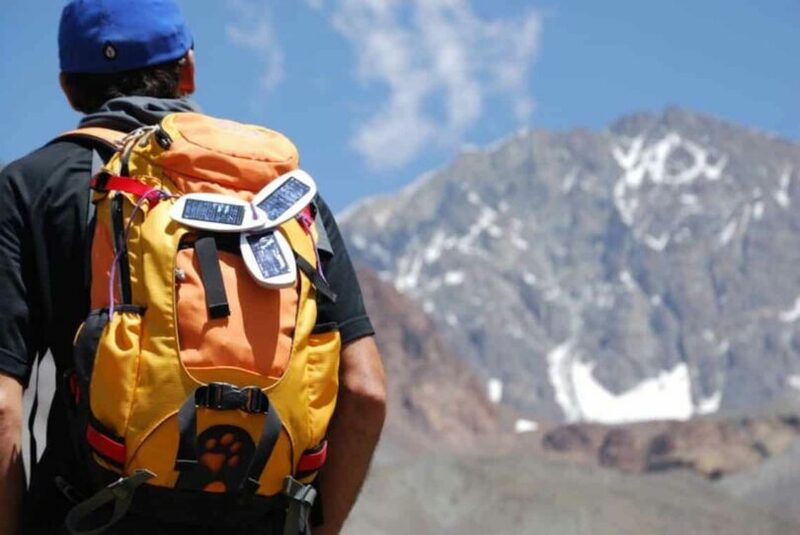 In this article, we will cover how to select the best solar backpack and discuss a few necessary requirements the back you choose should have! When you are out to buy a new backpack with solar charging abilities, you first want to do a little research into how the bag charges, and more importantly what it charges. Devices require different outputs, different efficiencies, and even different ports to plug into. Make sure that the solar backpack you choose will charge your desired electronic, whether it’s a smartphone, tablet or handheld GPS device. Below we will walk through some of the specs, and what they mean. The spec to look for when you are shopping for the output power is the total amperage of all the ports combined. Output power is the maximum output, and certain phones, especially our beloved smartphones require more output than others. When you are looking at the output power you are determining if it’s enough for your device to charge, and how long it will take for your device to charge. When you buy your solar backpack a good rule of thumb is to get a backpack rated with 1 amp for a phone or 2.1 amps for a tablet. Backpacks are normally equipped with USB ports that you can plug your device directly into, however, you may be wishing to charge your camera’s batteries on the go, or even a full laptop, that requires you to have a wall port. Purchasing an inverter can help, however, the adapters convert the power, and so there is a significant loss of power to the device with a solar backpack. Meaning it will charge slower. Most bags will have 5V USB ports for you to charge your devices with, what you want to keep on the look out for is voltage stabilizers. Sunlight and the power it provides can be very unstable and fluctuates throughout the day. 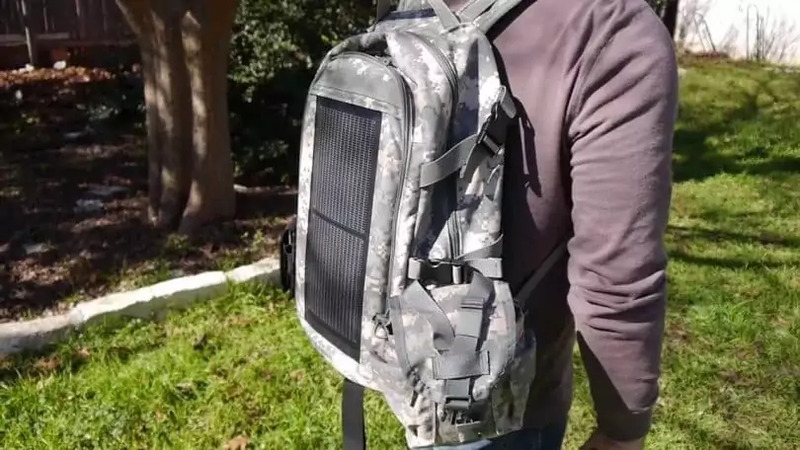 Whether you are directly connecting your device to the solar panel or using a battery as a middle man, you will still want to purchase a backpack with a built-in stabilizer. When you go to purchase a solar backpack keep in mind what type of product you plan to charge on the go to pick the right pack. Some will be more expensive because they produce a higher output power, so if you are looking to charge a camera or larger device, this might be the way to do it. When you are studying the specs, keep in mind where you plan on taking the backpack, is it in the bright sunny desert? Or are you headed to a cold mountain, with minimal sun? These devices may not generate as much energy as you need for large devices, so at the end of the day, consider your budget, but also your devices and the location of your next trip. For more options, see our reviews of the best solar chargers to power-up your gadgets. A solar backpack is still a backpack, and with that, you are not going to want to skip comfort and safety when selecting a backpack. After you have determined if the solar strip has enough output power, amps, and watts, you are going to want to see if the backpack is worth carrying. If this is the first time you are bringing your devices along for the camping trip, then you are going to want to factor in the extra weight. A good backpack is going to give you two main features: Support and Comfort. When you are looking at the backpack to determine if there is enough support to be bringing along heavy devices and an additional solar panel, you want to make sure your shoulders and lower back are protected. The simplest way to tell is if there is adjustability for the full backpack. Does it have should straps that you can let out, or pull in depending on weight? Does the backpack feature hip straps that take any additional weight of your shoulders and lower back? Pick a backpack that will best accommodate the load you plan on hauling, and has the most customizable options. Support is not the only necessity, when you are traveling for long periods of time, being comfortable with your backpack is going to be a necessity not a luxury. Make sure there is an appropriate amount of padding along the straps and back of your pack. Try the backpack on to make sure it is the right size, and then if possible find fabric that wicks away sweat from your back and shoulders, especially if you are going on sunny hikes! 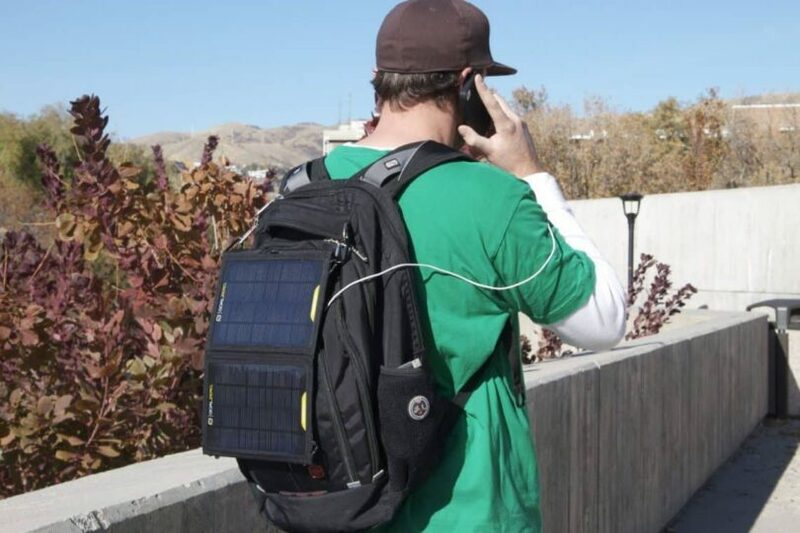 The point of a solar backpack is to create an easy way to charge up your devices while out on the trail, it would defeat its own purpose if it was difficult to use. The last thing you want to be doing is messing with controls, charging ports, and the functionality of the solar backpack. 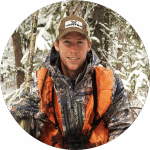 When you look through the gear reviews make sure that it both user-friendly and effective. Ideally, the solar panel on the backpack should be self-operating, and not constantly pulling your attention away from your surroundings. 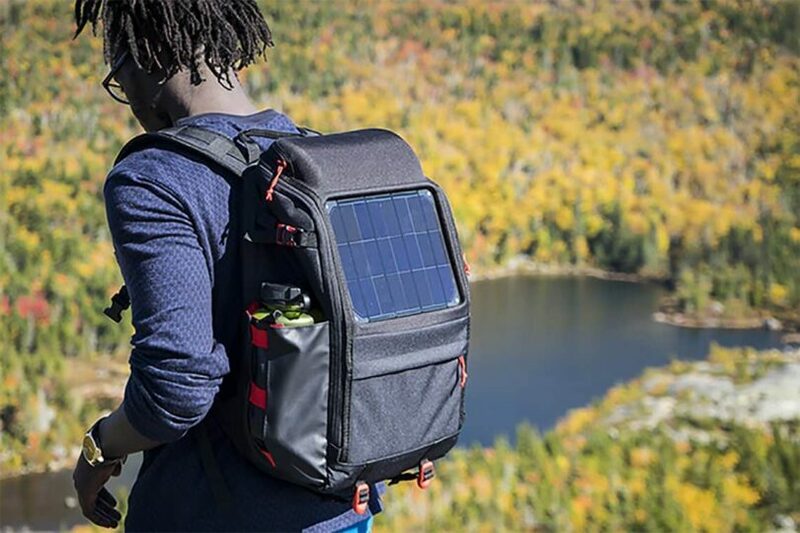 The solar backpack allows for you to charge on the go more efficiently than if you were to bring a solar strip that you need to set up. By having the panels and necessary USB ports directly on the backpack itself, it saves you the time and effort of making sure that your position is right, and the charger is working. It also saves you backpack space. 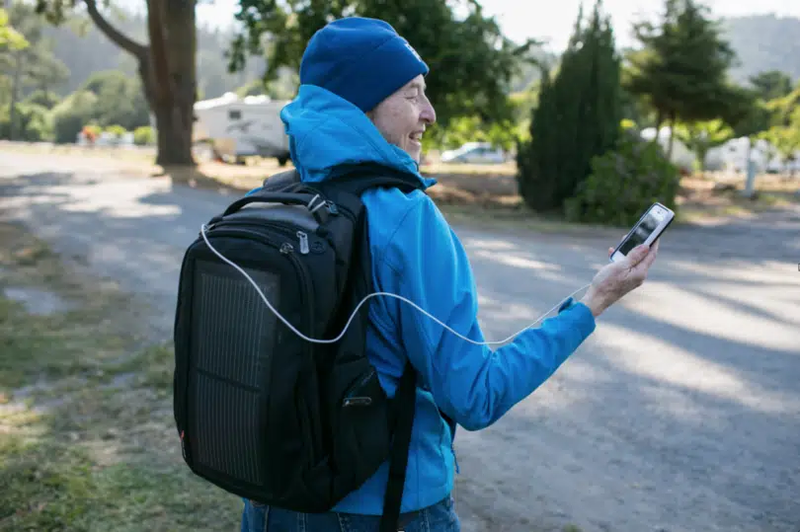 Rather than dragging strips along to power your phone, and carrying the whole set up inside the bag, a solar backpack gives you the same roominess and storage in the pack while still protecting and charging you gadgets. Now that you know what to look for in your new solar backpack, we have a few options for you to start your search with. Keep in mind that you want a reliable solar backpack, with enough juice to charge your electronics, while not sacrificing comfort or support! 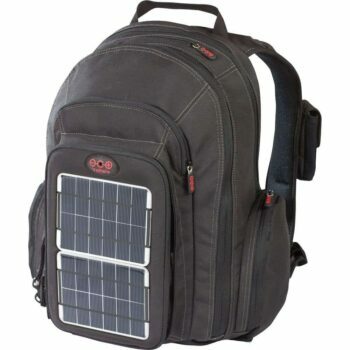 Specific Features: The 7-watt solar charger backpack is lightweight and durable with rugged high-quality nylon fabric. The solar cells themselves have a 22% transfer efficiency and are sewn into a PVC fabric that will prevent leaks or damage in case of bad weather. There is a 5 volt USB port, and it comes with a voltage stabilizer to protect your devices. It comes with the charger panel, a power bank, and a micro USB cable. Best use: Day hiking, daily use, and charging. Customers really love the sleek design of the ECEEN Solar Backpack, the storage capacity, and the many pockets to organize all of their gear before they hit the trails. The customer service team works well to help replace any parts that don’t work, and the backpacks adjustable straps make it comfortable to use. It is also incredibly lightweight and is capable of charging smartphones, GoPro cameras, and most GPS devices. 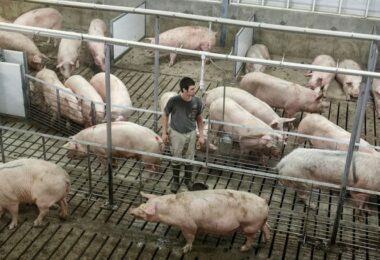 There is a quality control issue that comes up with a few customers who have noticed issues with the solar panel itself. While the company is willing to swap out for a stronger solar panel, you may notice that the original panel is a little weak, and breaks easily. Their battery also has a few technical glitches and also breaks down relatively easily. ECEEN does have excellent customer service reviews, so if this backpack fits right, and serves your needs, you can contact the company to swap out any glitching gadgets. Specific Features:Made from polyester materials this durable backpack not only provides solar power, it is also a 2L hydration bag. The removable 6.5W solar panel has its own micro charging cable but does not include a battery. There is a 22% transfer efficiency and direct device charging that has a stability controller for the safety of your device. Best use: Hiking, camping, day to day use. 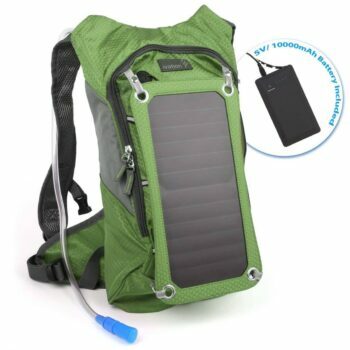 The Solar Charger Hydration Backpack itself is lightweight and durable, make it a fan favorite among reviewers. The 2L bladder holds just enough space for the water needed on a hot day trip, and the shoulder straps are easy to adjust. The backpack itself has a layer of mesh on the back and shoulder areas, making it breathable. People also love that the comfortable backpack allows you to unclip the solar panel and the bladder, making it light weight for trips that don’t require gadgets, or able to hang it on a sunny tree at your camp site. So what is not to love about this backpack? Some customers have complained that the water bladder is not durable enough to hold the full 2L of water! Leaks have happened inside the bag and in the hose and mouth piece. The solar panel also requires a couple of hours before it fully charges the phone. 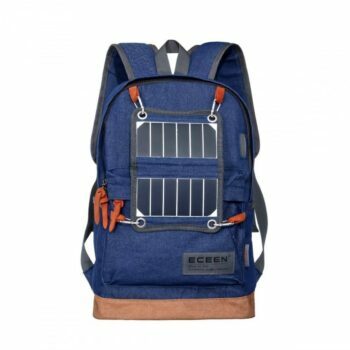 Specific Features: This backpack features a 7-watt solar panel with an impressive 10,000mAH power bank to store energy. It is both waterproof and durable with two 5 volt USB output ports. There is a voltage stabilization system to protect your smartphone, battery packs and GPS. It includes a 1.8L bladder and hydration system. Customers love the Ivation 7 W Solar Charging Backpack and charging system in this backpack, and it is one of the higher rated panel systems. The bladder system works well, and the battery, which is normally a problem, is built to last in the backpack. 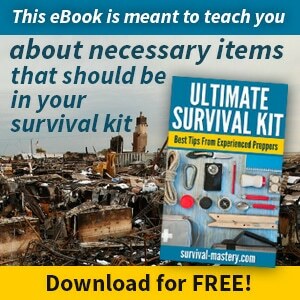 Within two hours you can revive a dead cell phone, or charge up a GPS. What we aren’t impressed with is the actual storage ability of the backpack, it is relatively small and will not hold all of your equipment for longer hikes. Also, the straps are rather narrow, so if should pain or discomfort is something you experience with other backpacks, try this on with weights before purchasing. Specific Features: The backpack itself is made from cotton polyester and denim fabric, and features wide shoulder straps. The 3.5W solar charger is removable and has a 22% efficiency. The pack includes a 2,000mAh battery pack, for additional storage and it even has a LED lighting design along the outside to illuminate your outdoor activities! Best use: Casual day hikes, car camping, day to day use. This stylish backpack features a foldable solar charger and battery so you can charge on the go, and then save the power for later. People love that the Hiking Daypack, Lightweight Backpack is light weight and that the shoulders are comfortable to use with enough storage space for day to day use. For a smaller solar charger, it does the trick for quick fix charges, and the LED system is both unique and helpful when looking for items at night. Some reviewers complain that the solar panel does not charge quick enough for their electronics to be juiced up and ready to go. There was also some concern about the USB cord that is included not working properly. The company is quick to respond and replace parts on the bag that are not working, and using your own charging cord seems to fix the problem! In addition, the backpack seems to be on the small size, and not suited for big outdoor adventures, but rather small day hikes or car camping trips! 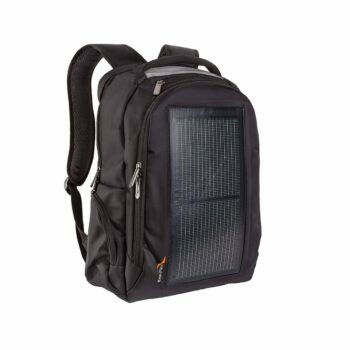 Specific Features: The slim daypack features it’s own 4,000mAh battery, that can be charged from any USB cable, whether you use the solar panel or your computer to charge it up. The solar panels have a total output of 6V and are both waterproof and scratch resistant. The backpack is the environmentalist dream, being both solar powered and made from recycled materials with just over 970 cubic inches for storage. 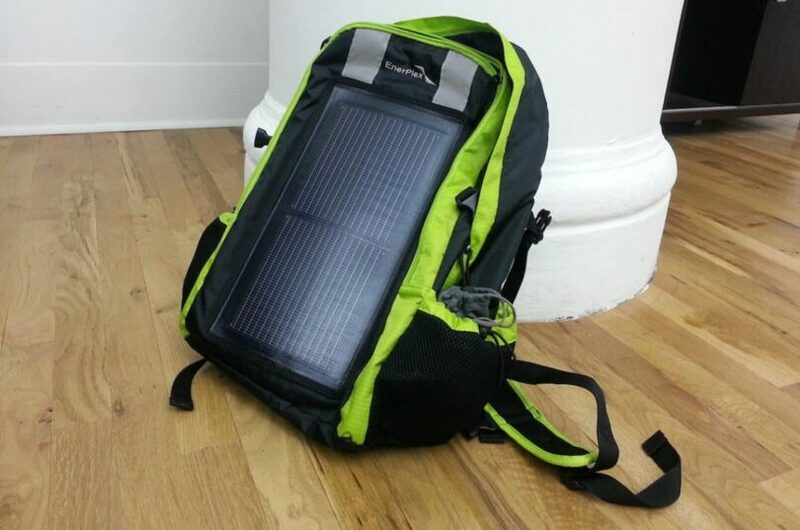 Voltaic is known for their excellent solar panel products and this backpack lives up to its brand. The panel itself is extremely durable, charges your phone completely in under 6 hours, and while it is on the bulky side, it is very comfortable. 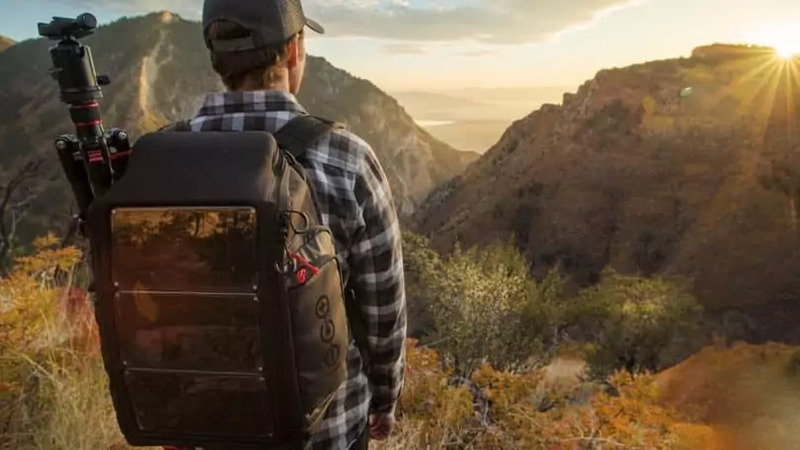 The Voltaic Solar Converter Daypacks is designed to distribute weight evenly, so those with back problems can rely on a comfortable trip in this backpack. The material the backpack is made out of is both waterproof and durable. Some say that the solar panel takes too long to charge, but it ultimately depends on the product you are charging. Like most batteries, after long term uses the otherwise durable battery on this backpack will need to be replaced. 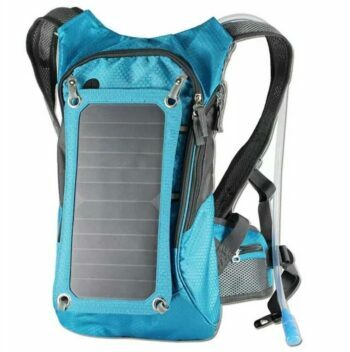 Specific Features: SolarGoPack features a durable and powerful removable solar panel, as well as a 5w, 12000 mAh battery. It is compatible with most smartphones, charges GoPro cameras and has a built in hydration system. 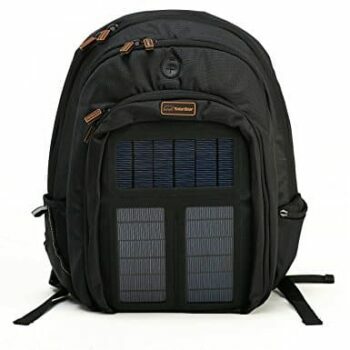 This SolarGoPack Solar Backpack is used mostly for the city dweller and works well when charging small devices. The battery included does take a while to fully charge, but is durable and lasts longer than most built-in batteries. It is rather bulky, but it features both padded shoulder straps and a sternum strap to keep weight well dispersed. Customers enjoy the padded back with helps protect the small of their back while carrying all of their heavy devices. 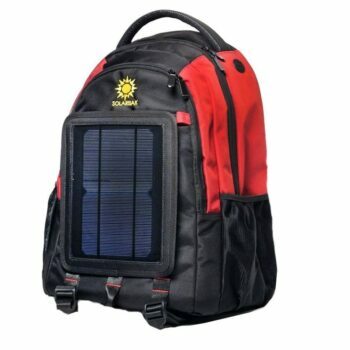 As with most solar backpacks, some customers believe that the panel is not strong enough, and takes too long to charge up their electronics. However, the company does sell warranties on this backpack, so if the battery or panel needs to be replaced you can do that with relative ease. Specific Features: EnerPlex features a padded laptop sleeve, several interior organizational pockets and plenty of compartments in a variety of sizes. It has space for water bottles and two external zip pouches. It features a patented CIGS 3 watt solar technology that has a total 0.6 amp output. Best use: City dwelling backpack for business day to day use. Customers really enjoy the sleek design of the EnerPlexPackr Solar Backpack that they can take on the go. It charges cameras, smartphones, and tablets. It is built well, with durable fabric and the solar panel attached is also very durable. It is important to note that this particular backpack is not made for rugged outdoor use, but rather for light hiking or city use. While it is durable, it is not waterproof or resistant, and the shoulder straps have been known to break after frequent use. 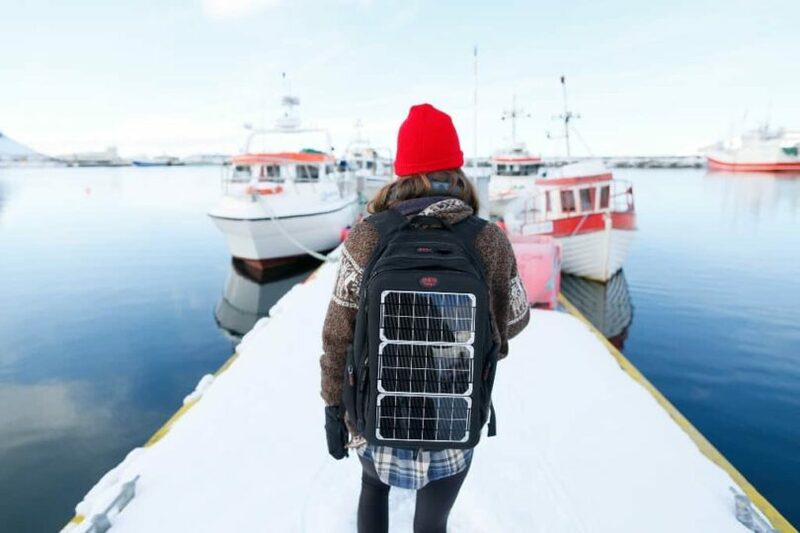 Specific Features: This backpack is equipped with three solar panels that have a combined total of 5.5V with a lithium battery that requires only 4 hours to charge. It comes with its own rain cover, is made out of durable nylon. And features a comfortable padded back. Reviewers thoroughly enjoy the comfort of the Solar Bear Solar Backpack, it’s shoulder and waist straps combined with a padded back allow you to adjust for both support and comfort while on the go. It is a great size backpack, that is pretty durable and can either be used for day to day use or light hiking. 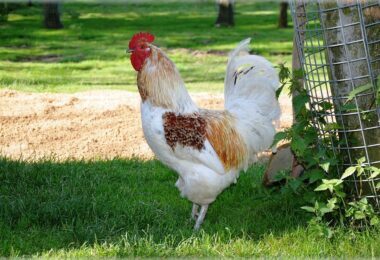 It is simple and stylish, with an optional warranty. Some people find that the SolarBear battery that comes with the pack needs to be replaced almost immediately. There also seems to be a small glitch with the battery that can cause your phone to have glitches, this could be because the backpack does not feature any voltage stabilization. Finding the right solar backpack for your off the grid adventures will come down to support, comfort, and the total output of the solar panels! Once you determine where you are going, and what devices you would like to bring along, finding a backpack that can charge them will be a breeze. Even the outdoor purist will want a pack that can charge their camera, GPS, and emergency cell phone. Have we missed your favorite solar backpack? Let us know in the comments below! To find out how solar panels work to give you energy, click on the link to our article for more information.